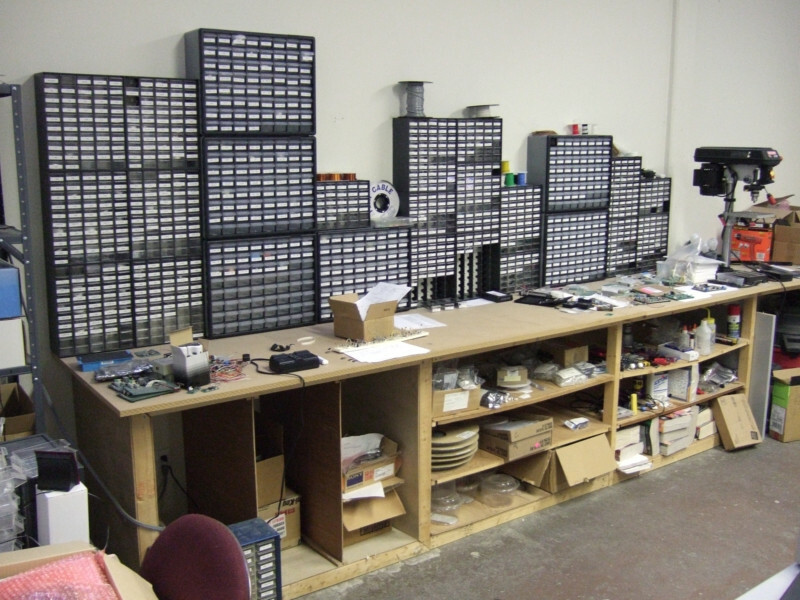 To organise electronic components (and other small stuff like screws, springs or washers), most people use large organizers. They're indeed cheap and versatile, but they don't really fit in a living room as they're bulky and not very good-looking. As a minimalist, I like to keep my living space clean and simple - everything should fit the same colour theme and any unnecessary details should be avoided. But every once in a while, I love playing around with electronics to learn something new about the electronic engineering world. So I had to come up with a solution to keep my components and my tools organised while out of sight. The simplest way to hide stuff is to bury it deep in the bottom of a drawer - and that's what I did. But to maintain the accessibility to every component I had to make some additional modifications to the drawer. It's a fairly simple process and I'll tell you everything about what to do and what not to do. To organise the small parts, I decided to use small storage boxes. You can get them from Amazon or from Chinese Online Stores for much cheaper. The advantage of using those boxes is that they can be stacked and similar components can be kept in the same box. In addition, there are removable dividers to adapt to larger or more numerous parts. The boxes have a little hook on the side - it can be easily removed with a sharp blade as we don't need it. After some measuring, I discovered that the main drawer of my writing table had the same depth as the boxes. It was a really happy coincidence, but unfortunately, I couldn't just stack those boxes there and be done with it - every time I opened or closed the drawer, the boxes would slide around inside and potentially get open. To overcome that problem I decided to build a rack that would keep all the boxes upright and maximise the available space I have. To build the rack I used particle board (a.k.a. MDF), as it's cheap and really easy to work with. For the cutting, I used a scroll saw - you can get a decent one for under a hundred bucks. Or you can use a hacksaw, a jigsaw, a CNC, a laser cutter; you name it. We're going to do mostly straight cuts, so don't worry if you don't have any power tools. For the assembly, I used mostly hot glue. I also used some wood glue to seal the exposed edges of the particle board - but more on that later. Hot glue is pretty annoying to get off from wooden surfaces (but it's doable with WD40). So if you don't want to make your installation permanent, I suggest you to begin by making a square frame with the inner dimensions of your drawer. That way, you can glue everything to that frame and remove the whole structure if you need to, without leaving any permanent marks to the furniture. I began by measuring the inner dimensions of my drawer. I then cut a bunch of strips from the particle board, that were an inch narrower than the depth of my drawer (to have enough room to grab the edge of the boxes). I then cut the strips into smaller rectangles, that were a bit longer than my boxes (to have some clearance). I experimented with different sized dividers. The single dividers were easier to cut and install, but the double ones are a lot more rigid. They also make less of a mess when glueing. I also cut long strips that had the inner dimensions of my drawer. One of them will serve as a horizontal structural beam and the others will be placed vertically and maintain the dividers. To add to the rigidity of the rack, I added small joints. I began by tracing two lines 1/10″ from the dividers edges (the thickness of the particle board). I then marked the middle of the edges and cut out the bottom with the scroll saw (see the photos for the example). I then cut small incisions in the vertical support beams. Each incision was 1/10″ wide and separated by slightly more than the thickness of the boxes. The dividers should now slide in the support beams and stay in there if you managed to make a perfect cut. If you cut the incisions too large, don't worry, we'll fix that with hot glue. If you want to add detail to your organiser, you can add small incisions to the dividers. In addition to being pretty, they'll give your fingers more space to grab the edge of the boxes. I strongly suggest you to cut all the incisions in one go, after taping the dividers together. Not only will it save you a lot of time, but the outcome will also be more uniform (they'll look like little perfectly lined up stormtroopers). The surface of the particle board is covered with a protective layer that also solidifies the board. However, the exposed sides aren't very dense, and so they'll emit dust over time. To solidify the edges we can seal them with some homemade sealer. To make the sealer, mix water and wood glue (or PVA glue) in a one to one ratio. The water makes the glue more liquid and so easier to apply with a brush. The sealer should be completely transparent when it's dry. To assemble the organizers, I used hot glue. It hardens quickly and it works as a filler for the gaps between the joints. The excess can be removed with a utility knife blade. The first organizer that I made was glued to the sides of the drawer. If you want to keep your drawer intact, I suggest you to use the 'box method' like shown on the last images. The box that came with my caliper was bulky, and one of the slots that I made for the boxes turned out too small. So I decided to make a simple holder for my caliper by stacking pieces of particle board. Now I can access my caliper by opening the drawer just a few inches. The size of your organiser will depend of the size of your boxes and the size of the space available. As my drawer was too narrow to fit four rows of components boxes in there, I added a row of larger universal boxes. If your drawer is too deep, you can add pieces of MDF underneath your organiser to level it the to the right height. You can turn that empty space under your organizer into a hiding place if you want to hide your diary or your passwords. In another drawer, I made a kingdom of large stackable storage boxes. The structure is removable and tilts the boxes to the perfect angle to make them small enough to pass the drawer opening of the desk without any problems. It happens to own a box like the one you suggest, but the dividers inside it are shorter than the height of the box, so when I turn the box up side down some resistors, for example migrate to nearby compartments. Does this happens with the boxes you use in your project? In my case, there's no noticeable gap between the dividers and the lid (1mm?). Not all of these boxes come from the same factory, maybe you just got a bad specimen.